A unique and extraordinary opportunity to visit Singapore's latest incredible attraction which showcases biodiversity and sustainability: the Gardens by the Bay Nature Park. 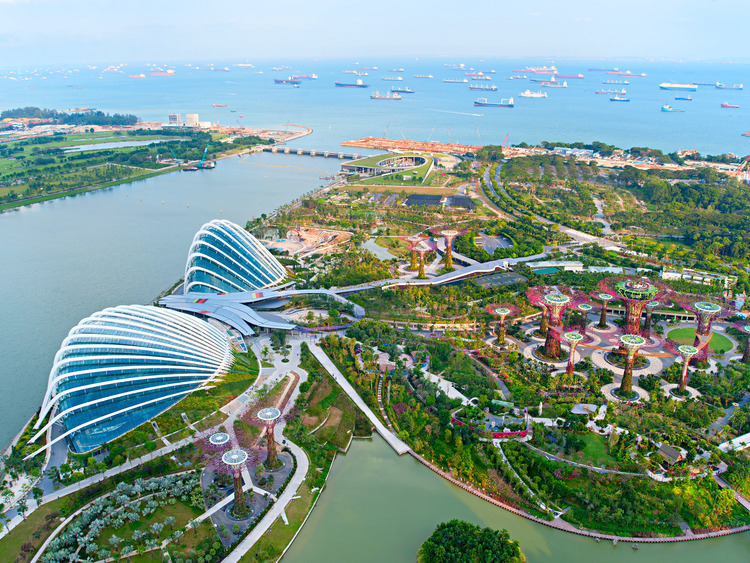 Gardens by the Bay is the city's new botanic park, spanning 101 hectares, of which a little less than 17000 sq m is covered by two enormous greenhouses, which showcase sustainability and boast bioclimatic structures. A visit to the park will also allow us to explore the outdoor gardens and see the Supertree Grove, a forest of gigantic trees 50 metres high with a reinforced concrete core and a steel frame trunk, covered with vertical gardens which are made up of 163,000 plants and 200 species of flowers. In 11 of these structures there are solar panels, which provide the complex with electrical energy. Supertree Grove boasts an aerial walkway (the OCBC Skyway) which links several trees making it possible to see the whole park from above. We then explore the botanical heritage with a visit to the park's two greenhouses: Flower Dome, with a semi-arid Mediterranean climate, and Cloud Forest, which recreates a rainforest environment. These two domes represent a design innovation and, surprisingly they are cool havens: indeed, the rare species housed here come from cooler climes than the sultry Singapore climate. Wandering along the garden pathways, we come to the*Hotel Marina Bay Sands*, where we have some free time to enjoy the wide selection of shops, the casino and to admire the spectacular architecture. The excursion is only available for guests disembarking in Singapore with flights departing from 5.30pm onwards.